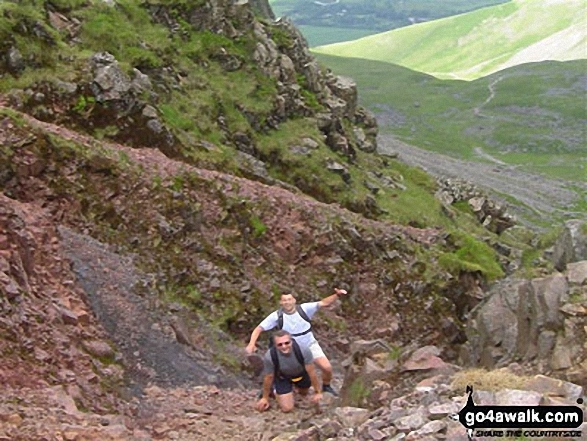 Route Summary: - Wasdale Head, Lingmell Gill, Brown Tongue, Hollow Stones, Mickledore, Scafell Pike, The Corridor Route, Sty Head, Lingmell Beck, Gable Beck Bridge, Wasdale Head, Wast Water. Route Summary: - Wasdale Head, Lingmell Gill, Brown Tongue, Hollow Stones, Mickledore, Scafell Pike, Mickledore, Lingmell Beck, Wasdale Head, Wast Water. Route Summary: - Seathwaite, Grains Gill, Styhead Gill, Styhead Tarn, Corridor Route, Scafell Pike, Broad Crag, Ill Crag, Great End, Esk Hause, Grains Gill, Seathwaite. Route Summary: - Wasdale Head, (National Trust Campsite), Wast Water, Lingmell, Corridor Route, Scafell Pike, Mickledore, Foxes Tarn, Symonds Knott, Sca Fell, Lingmell Gill, Wasdale Head, Wast Water. Route Summary: - Seathwaite, Stockley Bridge, Grains Gill, Ruddy Gill, Sprinkling Tarn, Esk Hause, Scafell Pike, Esk Hause, Grains Gill, Stockley Bridge, Seathwaite. Route Summary: - Wasdale Head, Wast Water, Lingmell, Lingmell Col, Scafell Pike, Broad Crag, Ill Crag, Great End, Esk Hause, Sty Head, Lingmell Beck, Gable Beck Bridge, Wasdale Head, Wast Water. Route Summary: - Seathwaite, Grains Gill, Stockley Bridge, Styhead Gill, Styhead Tarn, Sty Head, The Corridor Route, Skew Gill, Greta Gill, Piers Gill, Scafell Pike, The Corridor Route, Sty Head, Stockley Bridge, Seathwaite. Route Summary: - Great Langdale, The Old Dungeon Ghyll, The Cumbria Way, Mickleden Beck, Mickleden, Rossett Beck, Rossett Pike, Angle Tarn (Langdale), Esk Hause, Great End, Ill Crag, Broad Crag, Scafell Pike, Esk Hause, Esk Pike, Ore Gap, Bow Fell (Bowfell) (North Top), Bow Fell (Bowfell), Bowfell Buttress, Cambridge Crag, Flat Crag, Climbers' Traverse (optional), Three Tarns, The Band, Oxendale, Stool End Farm, The Old Dungeon Ghyll, Great Langdale. Route Summary: - Wasdale Head, (National Trust Campsite), Wast Water, Lingmell, Middleboot Knotts, Round How (Scafell), Great End, Ill Crag, Broad Crag, Scafell Pike, Mickledore, Foxes Tarn, Symonds Knott, Sca Fell, Wast Water. Route Summary: - Great Langdale, The Old Dungeon Ghyll, The Cumbria Way, Mickleden Beck, Rossett Gill, Rossett Pike, Angle Tarn (Langdale), Esk Hause, Scafell Pike, Ill Crag, Broad Crag, Great End, Esk Hause, Angle Tarn, Rossett Gill, Mickleden, Mickleden Beck, The Cumbria Way, The Old Dungeon Ghyll, Great Langdale. Route Summary: - Wasdale Head, (National Trust Campsite), Wast Water, Lingmell, Corridor Route, Great End, Ill Crag, Broad Crag, Scafell Pike, Mickledore, Foxes Tarn, Symonds Knott, Sca Fell, Slight Side, Broad Tongue, Hardrigg Gill, Wasdale Head, Wast Water. Route Summary: - Eskdale, Wha House Farm, Hare Crag, Quagrigg Moss, Slight Side, Sca Fell, Symonds Knott, Mickledore, Scafell Pike, Broad Crag, Ill Crag, Great End, Esk Hause, Esk Pike, Ore Gap, Bow Fell (Bowfell) (North Top), Bow Fell (Bowfell), Bowfell Buttress, Cambridge Crag, Flat Crag, Climbers' Traverse (optional), Three Tarns, Great Moss, Brotherikeld, Eskdale. Route Summary: - Eskdale, Wha House Farm, Hare Crag, Quagrigg Moss, Slight Side, Sca Fell, Symonds Knott, Scafell Pike, Broad Crag, Ill Crag, Great End, Esk Hause, Lingcove Bridge, Great Moss, Eskdale.